« Book Smarts: What’s on Your Wall Shelves? So imagine my love of pairing seemingly contrasting items for a surprising home decorating idea. 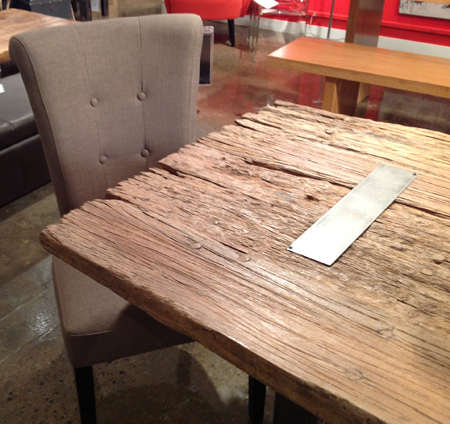 For example, pairing soft textured fabrics with the rough feel of reclaimed wood. Soft chair…rough table. Love it! 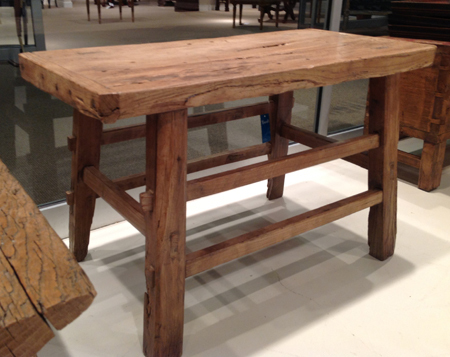 Try this: Take a look at the reclaimed wood table below and find something visually appealing in your house that would not be an obvious pairing. Fun, isn’t it? I bet you actually came up with several items. When you free yourself to look at a broader range of options for home decorating ideas, the combination possibilities suddenly grow. This is especially true of reclaimed wood. Reclaimed wood touches a cord with us on many levels. There’s something about making something useful again that is appealing. It seems to embody the circle of life and ground us in Mother Nature’s worldview. 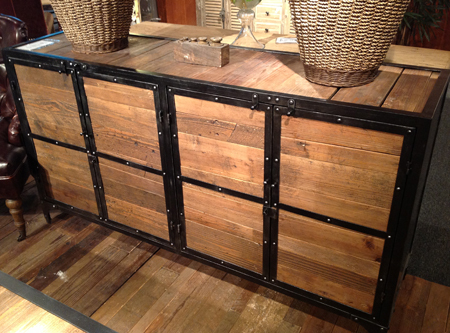 Once a rarity, reclaimed wood furniture is becoming more and more accessible. Don’t let the industrial look of it scare you off. It just may be the piece that allows your other pieces to really shine. So the next time you see a home decor item that appeals to you don’t say, “Oh…but I don’t have anything that will go with that.” Stop for a moment and allow yourself to expand your design thinking! You’ll be surprised and happy with what you discover.